As vector-borne diseases crisscross the country, animal and human health organizations are working hard to raise awareness. An invasion is happening in the United States. Creepy crawlies carrying all sorts of vector-borne diseases are on the march or airborne. And neither pets nor people are safe. Illnesses from mosquito, tick and flea bites have tripled in the United States, with more than 640,000 cases reported from 2004 through 2016, according to a report by the Centers for Disease Control and Prevention. Nine new germs spread by mosquitoes and ticks were discovered or introduced into the United States during this time. Widespread and difficult-to-control diseases from mosquito, tick and flea bites are major causes of sickness and death worldwide. The growing number and spread of vector diseases pose an increasing risk in the United States. The report found that the nation needs to be better prepared to face the public health threat. With dogs and cats trekking inside and outside households, pet owners need to be especially aware and prepared. However, judging from compliance rates of preventive products and from consumer studies, a lot of work remains to be done. A study conducted by The Harris Poll on behalf of Merck Animal Health exposed some serious knowledge gaps among U.S. pet owners related to the identification, prevention and treatment of fleas and ticks. More than 1,300 dog or cat owners were surveyed. The results found that despite the dangers of flea infestations, ticks and Lyme disease, many pet owners may not be as knowledgeable — or as prepared — as they think they are. In fact, one-third said they do not give their pets regular flea/tick medication and nearly half didn’t bring their pets in for routine exams to protect against these parasites. More than 3-in-5 pet parents said they were “very knowledgeable” about fleas and ticks; however, nearly 2 in 5 couldn’t correctly identify at least one symptom commonly associated with Lyme disease. Indeed, general awareness thus far hasn’t matched the speed at which vector-borne diseases are spreading. Most people probably have heard of a few diseases transmitted by fleas, ticks or mosquitoes, such as Lyme disease and West Nile virus, said Cameon Ohmes, DVM, MS, MBA, DACVIM, a senior veterinarian at Bayer Animal Health. Ticks are the headliners when it comes to transmitters of vector-borne disease, and they seem to be the parasitic threat most on the move. Yet, they weren’t really more than a dot on the radar 20 years ago, according to Joyce A. Login, DVM, senior manager of veterinary specialty operations at Zoetis Inc. This was around the time that more effective flea products were being introduced. Now, the situation has flipped. There is an awareness of fleas in the home, but people are understanding the value of keeping ticks off their dog. Dr. Login attributes the change to three things. First, Lyme disease has become much more of an issue. The second thing is that organizations such as the Companion Animal Parasite Council are educating clients about ticks and vector-borne diseases and the importance of protecting the pet. The third point? Proximity. People are much closer to their pets. Another reason the knowledge gap may exist is the rapid entry of parasitic diseases into regions unaccustomed to their presence. Dr. Login said the seasons and regional assumptions can get in the way of a consistent, industry-wide message on parasitic diseases and prevention. The conversation will vary slightly depending on the area of the country, Dr. Ohmes said. One animal health organization that believes strongly in year-round prevention is the Companion Animal Parasite Council. In 2011, CAPC board members agreed they needed to come up with a strategy that engaged veterinarians, pets owners and even doctors on the prevalence and spread of vector-borne diseases, and parasitic diseases in general. “What we started in 2011 was a new engagement strategy,” said CAPC’s CEO, Christopher Carpenter, DVM, MBA. The engagement strategy included two key components: prevalence maps and forecasts. When Dr. Carpenter worked in a veterinary clinic in the 1990s, he relied on older Heartworm Society maps. The threat level in specific areas was hard to discern. Technology has changed, and so too have the capabilities to track parasitic diseases. The CAPC Prevalence Maps are designed to meet today’s data expectations. Using the contributions of Idexx Laboratories and Antech Diagnostics as the foundation for the maps, CAPC is able to provide county-by-county rates and levels of parasitic diseases. It’s forced veterinarians and clients (if they are shown the data) to take notice. Veterinarians in one county can pull up the data and show that there were 28 cases of heartworm last month. The other component of the engagement strategy involves forecasts. CAPC went outside the industry to help create the forecasts. They reached out to Clemson University Professor Robert Lund, MS, Ph.D., an expert at forecasting hurricanes and climatology. Dr. Lund agreed to partner with CAPC to start a forecast for parasites in companion animal pets. How have the forecasts measured up? CAPC has never gone below 94 percent accuracy. “Your weatherman would be proud to say if he or she was as accurate on a day-to-day basis with their forecast,” Dr. Carpenter said. If You Tell Them, Will They Come? A 58 percent higher visitation rate from people who got the emails. When clients who received the emails came in, they purchased Lyme disease products, such as vaccinations, testing and tick prevention, at a 76 percent higher rate. The combination of prevalence maps, which talk about what has happened, and forecast maps can help veterinarians engage pet owners, CAPC believes. “CAPC has taught the industry that if pet owners know the local risk, if they believe there is a threat in their county using recent data, they will come in,” Dr. Carpenter said. Veterinarians can disseminate such information in a way that pet owners will fully understand the implications, Dr. Ohmes said. “Many of us are guilty of not spending enough time talking about parasites and their risks during wellness appointments because there is so much information to cover when it comes to the health of your client’s pet,” she said. “If we can make it a priority to start these discussions before they start seeing parasites in their region, we can help prevent the number of pets being bitten by parasites. Dr. Carpenter said veterinary practices should be proactive in sharing parasitic disease information. Parasites are a dynamic, ever-changing part of veterinary medicine, Dr. Carpenter said. 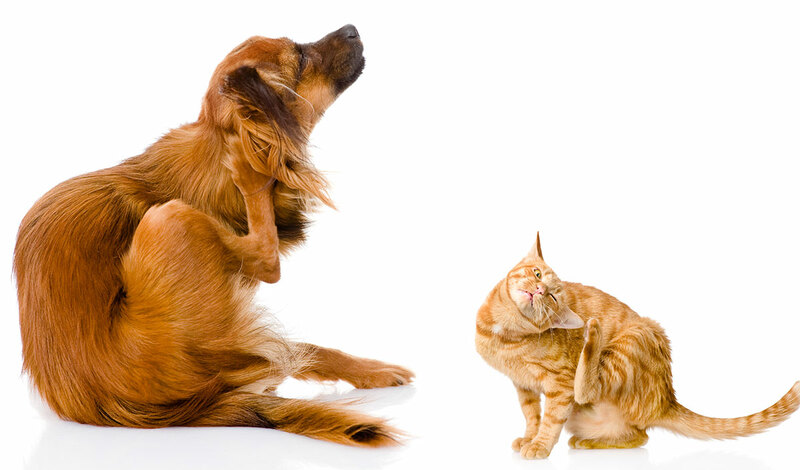 Fleas and ticks are only active in the spring and summer months. Ticks can only be found in heavily wooded areas. Dogs and cats living in urban areas don’t need flea and tick protection. The study confirmed that nearly all pet owners, regardless of age, want to keep their pets free of fleas and ticks. Ninety percent said they would “do anything” to protect their pets from pests.